I just landed in Chicago and I got the worst case of motion sickness during the bumpy landing. Anybody know a quick cure to get that feeling out of the body??? How has CrossFit helped you with outside activities and sports you participate in? I started back squatting when I joined the football team back in high school. I had never done anything like that before and it felt great to add weight and get PRs. It was definitely my favorite lift of all. On max out days, we would strap a sensor on the top of our quads. The sensor would beep when it was parallel to the ground and that is when you knew you went deep enough. The back squat helped me immensely in football and also in the sport I now play, Ultimate Frisbee. 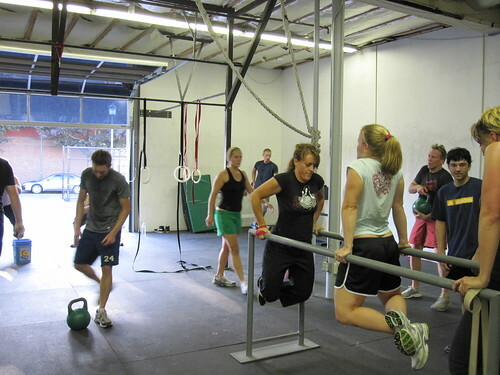 One reason why I love CrossFit is it teaches and practices solid methods that have worked since forever. Triple Treat, part 2. Matthew dropped in from CrossFit East Bay to get a WOD in before going back. Matthew is 15 and has been doing CrossFit for 1 1/2 years! Awesome work capacity and we wish you the best of luck on East Bay’s body weight competition this Sunday.